Pictures of Chinese President Xi Jinping posing with star CEOs and founders of Chinese and U.S. Internet giants garnered much attention on social networks during his visit to the United States. The Internet tycoons pictured possess a total wealth of as much as $2.5 trillion, having developed smart technologies that are transforming people's lives. The pictures were taken when over 200 members of the Internet industry elite from both China and the United States were granted the opportunity to enjoy a rare face-to-face talk with the visiting Chinese head of state. President Xi gave a speech at the Eighth China-U.S. Internet Industry Forum on September 23, calling on multinational companies to deepen cooperation with Chinese partners. Attendees engaged in broad discussion at the one-day forum, on topics including cybersecurity concerns , frontier technologies such as cloud computing and big data, as well as changes brought by the age of social networking. Many U.S. companies inked agreements with their Chinese counterparts during the event. The forum was co-founded by the Internet Society of China and Microsoft back in 2007, with the purpose of promoting communication and cooperation between China and the United States' respective Internet industries. Over the last eight years, the forum has become the highest-level dialogue between the two countries in this area. Lu Wei, Minister of the Cyberspace Administration of China, said at the forum that with respect to cybersecurity, the two countries are highly interdependent and mutually complementary in a wide range of respects, and thus, cooperation represents the inevitable choice for the two sides. "China and the United States, together accounting for nearly one quarter of the world's population, have become a community of shared interests and destiny," Lu said. Fang Xingdong, founder of BlogChina, said at the forum that China and the United States are the world's two major powers in cyberspace. In particular, China has grown to be an eminent powerhouse in cyberspace as the population of its Internet users has been growing exponentially in recent years. According to a news report from Thepaper.cn, a Shanghai-based Internet media outlet, the combined population of Internet users in China and the United States amounts to more than 900 million, accounting for approximately 30 percent of the world total. Among the world's top 10 most-visited websites, three of them are Chinese, and the other seven are U.S.-based. As for the world's top 50 websites, China accounts for 10 and the United States 37. The majority of the world's top 20 Internet giants are located in either of the two countries. "Mutual trust is the foundation for Chinese and U.S. companies to achieve win-win cooperation," Peter Sun, Chairman and CEO of Inspur Group Co. Ltd, a China-based IT solution provider, told Beijing Review . The current dispute between the two countries over cybersecurity has influenced other aspects of the bilateral relationship. This accounts for why so much time was given over to cybersecurity during the forum. Zhou Hongyi, President and CEO of Qihoo 360, China's largest Internet security solutions provider, stressed that cybersecurity is important for both Chinese and American Internet users and consumers, citing the recent X-code Ghost incident as an example. Not long ago, some Chinese developers used unofficial software tool to design apps for the Apple iOS. But malicious codes were somehow implanted in the software tool. As a result, when Apple users downloaded the apps developed by the tool, user information including iCloud account numbers, passwords and bank accounts became susceptible to theft. This incident affected a number of popular apps that have as many as 100 million users, Zhou said. "Apple's security check was thought to be the most reliable in the world, but the application environment of iOS is becoming more and more complicated. Finally, the myth of iOS being impenetrable has been debunked," Zhou said. Zhou noted that there are three security problems in the era of Internet of Things that we neglect at our peril: personal privacy security, personal payment security and personal safety. In face of such security threats, Zhou suggested that the Internet industry become more open and cooperative. Among the forum's participants, the universal sentiment was that open cooperation and dialogue trump confrontation. Many participants opined that as both China and the United States have been the victims of cyber-attacks, the two parties need to cooperate to solve the problem, rather than pointing the finger. "Security is the foundation of the development of the Internet industry. 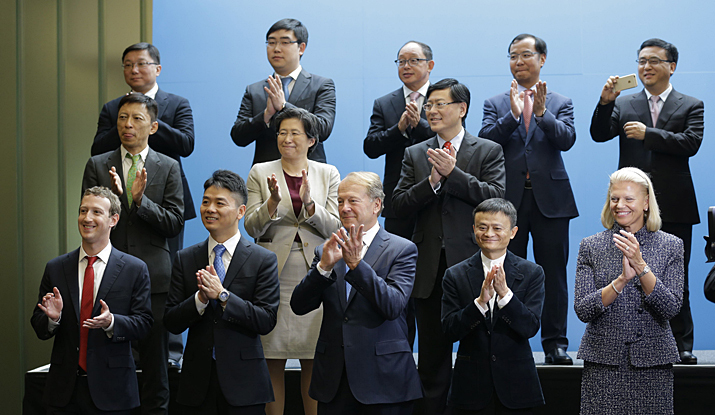 I hope China and the United States can join hands to make rules, improve management, strengthen supervision and upgrade technology for the global Internet industry," said Zhang Yaqin, President of Baidu. When meeting the participants after the conclusion of the forum, President Xi said a secure, stable and prosperous cyberspace is of great significance for the peace and development of not only one country but the whole world. Therefore, exploring how to govern and make good use of the Internet has become an issue of interest and a research topic in all countries. He claimed that no one can stay isolated from this cause. More than three decades ago, the Chinese cargo ship Liulinhai arrived in Seattle having traveled across the Pacific Ocean. It was the first Chinese cargo ship from the People's Republic of China to dock at a U.S. port since China had adopted its reform and opening-up policy. Coincidently, the very first U.S. ship to set sail for China began its voyage in Seattle. Two hundred years later, among its other 49 sister states, Washington State, where Seattle is located, still accounts for the largest share of exports to China. In 2014, Washington's exports to China accounted for about 90,000 jobs in the state. The unique economic and trade relationship between China and Washington State is widely seen as the reason why President Xi chose Seattle as the first leg of his U.S. trip. While co-hosting the China-U.S. Business Roundtable with 15 U.S. CEOs and 15 Chinese CEOs during the Seattle portion of President Xi's state visit, former U.S. Treasury Secretary Henry Paulson described trade and economic ties as "the glue that binds our two nations through the ups and downs of the bilateral relationship." At the Internet forum, not only did entrepreneurs from both sides have in-depth exchanges but they also agreed to engage in pragmatic cooperation. Many MOUs were signed including those between Microsoft and Baidu, Microsoft and Tsinghua Unigroup, and Cisco and Inspur. In a keynote speech at the opening ceremony of the forum, Dean Garfield, President and CEO of the Information Technology Industry Council, said, "The good news is that, in cyber sectors, we Chinese and U.S. companies are not sitting by the sidelines, waiting for our governments' policies. Industries in cyber sectors in the United States and China are collaborating together, to come up with so many solutions." According to the newly signed agreement, Cisco and Inspur will collaborate on a new joint venture in China with total investment of $100 million. Inspur will own 51 percent of shares in the joint venture. The two Internet giants also plan to jointly develop hardware. This is part of Cisco's huge development plan for the Chinese market. In June, Cisco announced its decision to invest more than $10 billion in China over the next few years. Peter Sun noted that Inspur's project with Cisco opens a new model for cooperation between U.S. and Chinese companies, providing the development of China's information industry with high-quality independent products and solutions in order to build a secure information infrastructure. Microsoft's deal with Chinese search engine Baidu attracted much attention as the deal will make Baidu the default homepage and search option for users of the Microsoft Edge browser in China. "China has the largest Internet market on the globe and is a paradise for U.S. hi-tech companies with unlimited business opportunities being brought about by more than 600 million Internet users," said Lu. He stressed that over 2,500 U.S. IT companies have invested in China, many of which have already started to earn more in China than on home soil. Lu also noted that the digital economy is one of the economic fields with the fastest development, the greatest number of innovations and the most extensive coverage, and its consequences for the overall model of economic development and its role in reconstructing the world economy are becoming increasingly apparent.